Arcadia is proud to announce it has acquired 21% of Marina di Torre Annunziata srl and, at the same time, an additional area for production and for hauling-out and launching near the shipyard itself. The new site is next to the current facility, which is the result of investments worth more than thirty million euro over the past ten years. Arcadia’s production capacity therefore rises by about 11,000 square metres (of which over 40% indoors), so the entire production area is now greater than 47,000 square metres. The surface has increased by 30% in relation to the current 36,000 square metre facility. The strategic choice is aimed at supporting an increase in the number of yachts under production and the after-sales services. “To increase production capacity, to develop larger products without altering the Arcadia DNA and to continue having a solid and direct relationship with our customers are the reasons behind this operation,” commented Ugo Pellegrino, Sole Director of Arcadia Yachts. “The orders taken, the ongoing negotiations and the enthusiasm recorded for the most recent models encourage me and the other shareholders to take on our entrepreneurial responsibilities and seize all the opportunities that arise - obviously assessing the related risks.” These positive feelings add to the importance that Arcadia Yachts has always associated with after-sales activities. 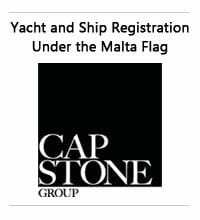 Thanks to post-sales work (this year 40% of customers had the shipyard deal with the wintering and maintenance of their vessels), Arcadia has succeeded in establishing solid, continuous and direct relationships with captains and Owners, to the point that over 25% of customers have become Repeat Customers over the years. “It was almost automatic for us to identify the acquisition of 21% of the Marina di Torre Annunziata as a fundamental option for the natural growth of our activities, in line with our principles and with what we have done so far,” said Mr Pellegrino. Another gratification for Benetti after the positive feedback from sponsors, yachting professionals, captains and crews who attended the Benetti Yachtmaster 2018. During the five legs of this edition more and more contemporary topics in the yachting business have emerged, above all the increasingly importance of environmental protection. After the October 2017 Spanish event and the last February Italian leg, in May it was the time of Miami for the last event of this edition. The US leg was preceded in April by the Singapore and Monaco Roadshows. Wonderful feedback for the eighteenth edition of the Benetti Yachtmaster, the event that gathers together captains and yachting professionals and brings them up to speed on all the novelties and at the same time offers a series of panel discussions and networking opportunities. In addition, the last US event (from May 2 to 4), which ended with a large party and the promise to return next year, confirmed the success of this event and affirmed its role as one of the most important gathering of industry professionals, organised by a private shipyard. Important novelties have been introduced for this last leg. First and foremost was the change of location: Benetti has left the water and chosen to move to exclusive downtown Miami, the beating heart of this city with its spectacular ultra-modern skyline. Introduced by Roberto Corno, Worldwide Sales Director, the American event was attended by 34 professionals, many of them attending Yachtmaster for the first time. The Frauscher shipyard now has a distributor in Croatia. The new sales partner “Master Yachting” celebrates its 40-year anniversary by entering into this exclusive partnership. Franz Schillinger of Master Yachting: “We are an extremely successful enterprise, and our collaboration with Frauscher is a logical step on our course of expansion. An exclusive brand like Frauscher is a real enrichment for the Croatian market, and I am looking forward to working together with them. After all, we are talking about a company that is probably the world’s best boat builder in the luxury segment.” Stefan Frauscher of Frauscher Bootswerft: “The Frauscher motor yacht is a statement. We believe in innovation and quality, and especially the multi award winning design and impressive handling characteristics of our boats meet the stringent demands of their owners around the world. Our customers value luxury standards, and our job is to exceed these standards and open up new dimensions.” For exclusive test drives the Frauscher 1017 GT will be available in Marina Kaštela (Croatia) starting 15 August 2018 and at the Yachting Festival in Cannes from 11-16 September 2018. The award winning top-line gentleman’s racer features an exquisite interior, plenty of elbow room, and a high standard of comfort. Its strengths are of course the high-performance and agile handling characteristics which are typical for Frauscher. The 1017 GT is designed for speed and driving pleasure, and was given an award in 2014 in the Performance Boat category. 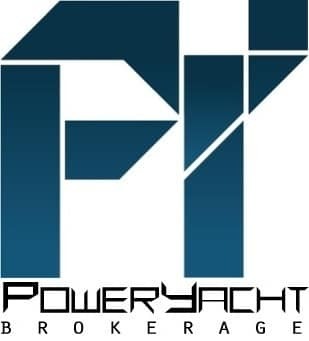 Master Yachting was established in 1978 in Vienna with sales offices in Munich, Dresden, Düsseldorf and Zurich, as well as dealers in the Adriatic region, Greece and Turkey. In real life the Frauscher 747 Mirage is a luxurious and sporty day cruiser with power up to 430 HP. The race car-like design emphasises Frauscher’s roots in racing. Now children too can fulfil the dream of owning such a high-performance motor boat. Because the Frauscher 747 Mirage is now available as a SIKU boat. The miniature version of the elegant motor yacht will delight both children and adult boat enthusiasts. It is designed to float and is therefore ideal for taking a spin in the bathtub or kiddie pool. The motor yacht is best transported on a specially designed 300 HP MAN truck. The Frauscher 1414 Demon is the largest motor yacht manufactured by the Austrian shipyard and is considered the company’s ultimate masterpiece. With a length of almost 14 metres and two motors that deliver up to 520 HP on the water, this extraordinary offshore yacht takes the Frauscher feeling to the next level. In the new video game “The Crew 2” one can now challenge the 1414 Demon.Ubisoft, one of the biggest developers of games with subsidiaries in more than 20 countries, has launched the thrilling video game for PC, PlayStation 4 and Xbox One. In celebration of the Eastbay’s 25th anniversary, Grand Banks held an owners rendezvous at the Mystic Seaport Museum in Mystic, Conn., June 9-10. The owners of a dozen Eastbay yachts ranging from 38 to 55 feet convened for a weekend of camaraderie. Attendees were treated to a behind-the-scenes tour of the Mystic Seaport Museum, the nation’s leading maritime museum and a center for research and education, which included access to various collections and moments of nautical history. Owners toured one another’s Eastbay yachts, seeing how each has chosen to customize and decorate. Following the report that was released by The Superyacht Group recently related to the global ranking of international shipyards, we are proud to note that Gulf Craft has climbed to 7th position. This magnificent achievement is a manifestation of our investment in international markets but more importantly the trust that our clientele have vested in us. Bringing in markets like Australia and Europe to our forefront of attention have benefited us immensely. We will continue to invest in other markets and also penetrate new markets soon as the range we offer is second-to-none. Founded in the Emirates in 1982, Gulf Craft continues to redefine the on-water living experience with its wide variety of premium craft, ranging from 27 feet to 175 feet in length. Deploying advanced technology, powerful engineering, and timeless design, Gulf Craft builds each creation to meet the diverse requirements of its discerning clientele, transforming travel by sea into a journey worth indulging in. With an expanding portfolio that includes the enchanting Majesty Yachts, the oceangoing Nomad Yachts, Silvercraft fishing boats and family cruisers, and Oryx sport yachts and cruisers, Gulf Craft has built an enduring legacy. Hatteras Yachts, a world leader in the construction of convertible sportfishing and luxury motor yachts from 45 to 105 feet, is proud to announce that the Hatteras GT63 Post Onesuccessfully completed a transatlantic crossing from Bermuda to Horta in the Azores. The 63'10" sportfishing yacht made the trip accompanied by her owner’s motor yacht, the 148-foot Cheoy Lee M/Y Dorothea III, which refueled her “fishing tender” en route. Captain John Crupi, fleet captain for Dorothea III and Post One, reported that the 1,985-nautical mile, nine-day trip made history according to 30-year Horta resident and Port Agent Duncan Sweet: The Hatteras GT63 is the first production-built fiberglass sportfishing yacht to have made the transatlantic crossing on its own bottom. “I’ve called the ocean home for more than 20 years. Having traveled hundreds of thousands of miles, you sort of become used to things not going as planned, said Capt. Crupi. “When we first came up with the idea of both Dorothea III and Post One crossing the Atlantic together, my mind immediately switched to the ‘what ifs’ and contingency planning to deal with issues underway. While we had plans in place for these ‘what ifs’, they simply never happened. Between June 19th and July 21st, Post One traveled 4,085 nautical miles on her own bottom from Panama to Azores, Portugal. During this she also fished six days in Bermuda. That is a total of 27 days underway in a 33-day time span without a single issue. That is simply amazing. Post One performed flawlessly – a real tribute to the Hatteras brand and to the people who build these boats. 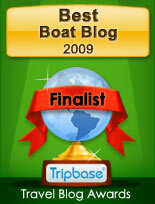 Great Job, Hatteras!” Capt. Josh Heater, who was at the GT63’s helm for the transatlantic crossing, said: “Team Hatteras isn’t a concept – it’s a reality. The attention to detail, advanced hull design, engineering, and fit and finish is what makes this boat and this brand a legend. As the saying goes, there’s no ‘I’ in ‘team’ and that is a philosophy that is applied at its highest level from lamination through delivery. Thank you, Team Hatteras – you built us a great boat!” “The ultimate test for any sportfishing yacht is seaworthiness and offshore capabilities,” said Hatteras Yachts President and CEO Kelly Grindle. “Only the Hatteras GT Series deliver speeds in excess of 40 knots with tournament-ready fishing features, and are built to be tough and reliable in a wide range of sea conditions.” Post One and Dorothea III left Bermuda via Town Cut at 6:30 am on July 12th. Captain Josh Heater drove the Hatteras GT63, while Captain Crupi was at the helm of the Cheoy Lee. Thanks to savvy weather routing, the yachts enjoyed the benefits of a high-pressure system, including light winds and relatively calm seas, during the crossing. This greatly aided them in the tricky procedure of refueling Post One from the mother ship’s diesel fuel reserves, utilizing a specially adapted fuel fill on the sportfisherman. Three times during the crossing, the crew transferred close to 1,500 gallons of fuel between the two boats while under way. The yachts arrived at Horta at 8:00 am local time on July 20th. “Captain Heater did an amazing job and all who know him are very proud of what he has accomplished,” said Capt. Crupi after the GT 63 made. 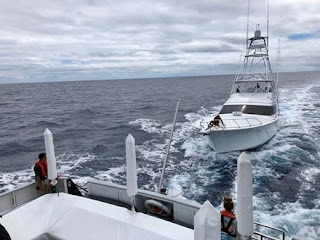 “Except for a washdown and some interior cleaning, fishing preparations had all been done en route, and Post One will be fishing for blue marlin on Azores Bank tomorrow.” Post One’s owner and crew are not only fishing for sport. They recently embarked on The Marlin Mission, a fundraising campaign that gives donors the opportunity to pledge a dollar amount for every blue marlin the Hatteras GT63 catches. The proceeds will be used to purchase much-needed school supplies for children in the Islands of Cape Verde and the remote communities of Brazil. The Hatteras Club Rendezvous fleet left Fort Lauderdale’s Port Everglades Inlet on Friday, June 22, bound for Grand Bahama Island. The mix of motor and sportfishing yachts that participated in the 2018 Rendezvous included: • M90 Panacera Snowghost – Florida • M75 Panacera Quay II – Florida • M60 Getaway – Florida • 68 Convertible Showtime – Puerto Rico • GT45X Reel Energy – California • GT63 Hatterascal – New Bern, N.C. After three hours under way, the fleet, led by the brand new GT63 Hatterascal, arrived at the Grand Bahama Yacht Club. All the vessels received complimentary washdowns from the marina staff, which we enjoyed at each stop throughout the trip. That evening, everyone gathered for a welcome cocktail party poolside with traditional Bahamian fare, cocktails and live Junkanoo music and dancing. On Saturday, we arranged for a local catamaran to take the group snorkeling. Afterwards, we all headed to a pristine beach for Bahama Mamas and a BBQ lunch. Sunday saw the fleet move on to Chub Cay, a private island at the tip of the Berry Island chain that’s known for its outstanding fishing. That evening, everyone decked out their yachts for the Parrothead/Cheeseburger in Paradise-themed Yacht Hop on the docks, one of the highlights of the week. The contest for best décor, costume, signature cocktail, and tasting dish made for a very festive and fun evening. On Monday morning, the fleet took off for the five-hour run to Harbour Island, Eleuthera, in the Bahamas Out Islands. Once again, the voyage was ultra-smooth aboard well-built Hatteras Yachts. Romora Bay Marina, our home for the next three days, welcomed us with boat washdowns, cocktails and hors d’oeuvres. Rendezvous participants enjoyed plenty of free time to explore Harbour Island with its legendary pink sand beaches. But on Tuesday, everyone got together for the Amazing Race Golf Cart Tour, followed by a lunch at Romora Bay where we crowned the Amazing Race winners, shown at left. The next evening, Coral Sands Hotel hosted the group for cocktails on the terrace, followed by an elegant dinner accompanied by live entertainment. The Marina at Atlantis on Paradise Island was the final stop on the Hatteras Club Rendezvous itinerary. With the resort’s casino, water park (complete with shark-infested water slides) and shopping just steps away, there was plenty to entertain everyone, no matter their age or inclination! On Friday, the Hatterascal took the group to Rose Island, a spectacular private island about three miles from Atlantis. Complimentary parasailing and Jet-Skiing were accompanied by a delicious lunch on the beach. Saturday night’s awards dinner, held at Luciano’s of Chicago, a fine Italian restaurant on the waterfront in Nassau, gave the group an opportunity to get together, celebrate each other and share memories of the Rendezvous. The next day, the boats departed for the run back to Fort Lauderdale. Australian luxury motor yacht manufacturer, Maritimo, has reinvigorated its sales and marketing initiatives in the Americas, Canada, Puerto Rico, Mexico and the Caribbean as part of its international strategic expansion and brand awareness enhancement. Maritimo has engaged one of the most successful and experienced boating sector operatives in the USA, Dave Northrop, to head up the new sales structure across all these territories. For Northrop it is a return to the Maritimo fold having represented the company in the USA previously for 10 years. Maritimo currently exports approximately 50 percent of its production capacity to the USA and Northrop's appointment to boost international marketing efforts comes at a time when the company is enjoying tremendous success with its recently released revolutionary sport yacht range, the X Series. The X 60, revealed at the recent Sanctuary Cove International Boat Show, has already sold well into the US market and is tipped to enjoy broad appeal there when its exposure is ramped up as part of the new sales and marketing structure. Corbitt said Maritimo is extremely confident Northrop is the right person with the right ability, knowledge and experience to see the company's goals come to fruition. Dave Northrop, who will be dividing his time between Michigan and Fort Lauderdale, said he was excited to be back with Maritimo and operating in an expanded role. Pearl Yachts is delighted to announce that it has joined forces with Berthon, appointing the company as its dealer for the UK and France. The collaboration demonstrates Pearl’s commitment to its growing dealer network in line with a strengthening foothold in the 60 to 100 foot flybridge sector. Berthon will join Atlantic Yacht & Ship in the USA, Baxter Marine in Spain and Aquamarine ltd in Turkey to offer clients the Pearl range on both sides of the Atlantic. The dealerships will focus on bringing the new generation of Pearl yachts to their clients as well as pre-owned Pearls. Berthon is a family business and has been trading continuously since 1877 employing 150 people with its HQ in Lymington UK where they operate a deep water marina for yachts up to 40m, a boatyard where all skills are in-house (including 30 apprentices) servicing, repairing, maintaining, refitting and building leisure & commercial craft; finally, their large international yacht sales & brokerage division has strategically placed additional offices in La Napoule, France & in Newport, Rhode Island, USA with a total worldwide team of 18 yacht sales and support staff. Riva temporary shop: the legendary international yachting shipyard in the extraordinary setting of Porto Cervo. In a unique setting, elegance and style are fused and tell a legendary tale that continues to offer incomparable experiences and delights. This is the philosophy behind the Riva temporary shop selling Riva Brand Experience products, which will be open until 8 September. It is located at the new Waterfront Costa Smeralda luxury village, in one of the most exclusive parts of Italy. Designed by the internationally renowned architect Gio Pagani on behalf of Smeralda Holding, the refined setting plays host to world famous brands, luxury fashion boutiques and unprecedented events, which are made even more magical by high-profile guests such as writers, entertainers, athletes and artists from Italy and across the globe. The unique, inimitable items by Riva Brand Experience are the real stars of the Riva temporary boutique. The refined selection of accessories and furnishings is also available online, in the Riva Boutique. In addition, a Riva Iseo is on display to add an extra special touch to the brand’s temporary home at Waterfront Costa Smeralda. Guests can get a close look at the 27-footer, which is one of the most popular masterpieces by the long-standing shipyard from Sarnico. The Riva temporary boutique joins an assortment of one-of-a-kind Riva-branded locations in a range of forms: the Riva Lounge that takes center stage on the terrace of Gritti Palace in Venice (one of the most famous hotels in the world), the Riva Privé inside Milan’s Garage Italia, the Riva Private Deck set up by Mykonos’ Psarou Beach, and the Aquarama Lounge on the fourth floor of the Yacht Club de Monaco. The furnishings and accessories by Riva Brand Experience (starting with the Aquarama tables and chairs) are the key distinguishing features of all of these extremely stylish spaces, which are designed to entertain guests in surroundings with peerless atmospheres. There has always been a strong, fertile bond between artists and the nautical art of Riva. It has produced ample fruits in the worlds of film, fashion and industrial design. The close ties between artistic prowess and yachting ingenuity have been underlined thanks to the creative spark provided by the marvelous Salvador Dalí exhibition, which will take place in the Porto Cervo Conference Centre until 22 September. Visitors will get the chance to see 100 watercolor woodblock prints produced and signed by the master of surrealism. They are all illustrations of the Divine Comedy: the masterpiece by the Italian poet Dante Alighieri. They will appear alongside two exhibitions dedicated to legendary Riva exploits. The first is entitled “Riva Corsa” and it features pictures and photographs from the highly acclaimed book Riva Corsa. The Origin of the Myth. The publication depicts the world of boat racing, in which Serafino Riva (Carlo Riva’s father) claimed a stunning series of wins, awards and records from the 1930s onward. The remarkable sporting feats are noteworthy for a number of reasons, including the fact that they helped to shape the sublime skills of Carlo Riva, teaching him to design and build vessels that were not just attractive but also fast and capable of exceptional performances. “Riva e le donne” (“Riva and Women”) is a photography exhibition that charts the long, never-ending love felt by women all over the world for one of the most popular names in Italian style. The pictures portraying the liaison contain not only Hollywood stars but also the women who worked behind the scenes to build the dream. Every single one of them felt the allure of the timeless lines of the runabouts, the prized types of wood, the sparkling chrome and the colors, including the famous “Riva aquamarine blue”. Rosetti is ahead of the curve. Thanks to the Rosetti Marino Group’s proven experience in the field of shipbuilding, technological innovation and cutting-edge navigation solutions, we are working with the Group’s R&D department to transfer avant-garde Remote Control technology from the commercial sector and adapt it for use in yachting. Rosetti Superyachts is at the forefront of a technological innovation that provides a competitive advantage that no other yacht builder in the world can offer. In the autonomous revolution that is underway, nearly every transportation vehicle will eventually be self-driving. For cars, it is likely to take years before we see them operating freely outside of test conditions on our roads. But some commercial unmanned vessels may be at sea before the end of the decade and the logical conclusion is that superyachts will follow. The revolutionary Remote Control System is based on a M2M connection (machine-to-machine) system installed aboard Giano Tug guaranteed by two Internet encrypted tunnels that ensure Cyber Security with a direct connection between the ship and Remote Bridge, without needing to go through third party servers. It is thus possible to remotely manage Giano wherever it is, controlling the video system, the navigation, propulsion and engine room equipment. The Giano Tug, a Lloyds Register-certified tugboat, was presented during the 2018 “ITS Tugnology” convention in Marseille from 25 to 29 June, when Captain Carsten Nygaard was able to control the tug from the stand using the remote console. Using the same logic and remote console, which replicate the controls found on the bridge, a yacht could be manoeuvred without geographical limits by a senior officer located in a land-based office. The commands are relayed to dry land by the captain on board the vessel. A route can then be entered and the yacht ‘delivered’ to its final destination and progress is monitored via a video system and night-vision cameras, assuring double control during navigation to avoid collisions. Much of the technology for autonomous vessels is already in place, but regulation needs to be properly updated. Autonomous ships are an area of special interest to the International Maritime Organisation (IMO), which sets the standards for national and international waters. Last year, the IMO launched a regulatory scoping exercise to analyse the impact of self-driving vessels. The extent of regulatory change will depend on the level of autonomy permitted, and Lloyd’s Register, for example, has already published classification guidance for six autonomy levels. Maritime law is one of the oldest legal systems in the world that has successfully adapted from sail to steam and beyond – no doubt the same will hold true for autonomous remote-controlled vessels in the near future. A unique design approach, as well as a refined, timeless style, rooted in the company’s DNA, make Sanlorenzo one of the most valued brands worldwide in the yachting sector, with sales volumes that have increased over the last few years, especially in the European market. he latest data have been very impressive, with 41 fiberglass yachts sold in 2017, 15 of which were launched between March and July 2018, including: 2 motor yachts from the lines of planing boats SL78, SL96, SL106 and 3 units from the line SL86, showing off its timeless design and amazing seaworthiness whatever the conditions of the sea; 2 semi-displacement hulls of model SD126 and 1 hull SD112, which combine an external outline inspired by the great ocean liners of the 1930s with the possibility to fully experience sea life; 3 units of crossover yacht SX88, which belongs to the new fast displacement line SX, whose entry-level model SX76 will be presented in Cannes.9 more are expected to be launched next month. The yachts that have just been launched include SL86 E Motion, a model from the new hybrid propulsion and diesel/electric range launched in January 2018 which goes to show Sanlorenzo’s attention for the development of ecologically sustainable technologies. In fact these models are able to ensure greater efficiency, high comfort and safety, flexibility and a significant decrease in emissions. Having just reached such a major milestone as its 60th year in the business, Sanlorenzo continues its activity as a producer of sartorial yachts capable of introducing new ways of living on board with a bold, groundbreaking approach, achieving maximum harmony between interior and exterior spaces, imposing itself as one of the main shipyards worldwide for the production of yachts and superyachts. Sanlorenzo yachts are produced in the Viareggio and Ameglia shipyards which will undergo an important enlargement and restoration process, as will the shipyard in La Spezia, which focuses on the production of superyachts, with a 60-million euro investment, 30 of which will be used to create new products and for research and development. Thanks to the managing skills of Cavalier Massimo Perotti, Chairman and Ceo, Sanlorenzo continues to grow, as confirmed by the fact that its turnover went from 40 million euros in 2005 to 300 million euros in 2017, while still focusing on product customisation. As a matter of fact, for 60 years Sanlorenzo has created over 950 yachts, one different from all others, responding to customers’ specific requests. The Tiara Yachts and Tiara Sport Dealer network recently gained new representation in Australia with the addition of Matilda Bay Marine. As the authorized Tiara Yachts and Tiara Sport Dealer for the countries of Australia and New Zealand, Matilda Bay Marine offers complete sales and service of both the Tiara Yachts and Tiara Sport product lines. The Tiara Yachts product lineup includes models 39’ to 53’ in the Open, Coupe and Flybridge series. The Tiara Sport lineup includes the first outboard powered Tiara, the 38 LS, and the all-new 34 LS. The third time is yet another charm for Jon Gonsoulin, his daughter Katie, Captain Jason Buck and the Viking 70 Done Deal team. With the Gulf Coast Triple Crown Championship lead heading into the final leg, the Blue Marlin Grand Championship, the crew captured the Triple Crown for the third time after a dominant performance. At the BMGC Done Deal was named Top Release Team with four blues and one white marlin. It also took the 2nd Place Tournament Award after landing a 640.8-pound blue. Petite Katie whipped that fish after an eight-hour battle in the chair. In the history of this event, Done Deal is the only team to repeat as Triple Crown Champions. The team accomplished the feat back-to-back in 2012 and 2013. The third crown in 2018 sets an incredible new standard for competitive marlin fishing in the Gulf. "We've been fishing hard since 2013 to win the Crown again," Jon Gonsoulin said. "Adding Katie to the team as our designated angler has made it more special. There are a lot of great crews in the Gulf. But there's only one Captain Jason Buck." Done Deal wrapped up the season with a 1st Place tournament record blue in the Orange Beach Billfish Classic, 2nd Place Release in the Mississippi Gulf Coast Billfish Classic, 2nd Place in the Blue Marlin Grand Championship and bonus participation points. And they are in good company as four other Vikings stood at the top of the Triple Crown podium. Reel Addiction, a 56 Viking owned by Rocky Jones and run by Captain Scooter Porto, finished second in the standings. Reel Addiction had the 2nd Place fish in the Cajun Canyons Billfish Classic, 1st Place in the Mississippi Gulf Coast Billfish Classic and earned bonus points for competing in all five events. Third Place was Wynsong, Will Wilson's Viking 66 run by Captain Allen Staples. The team earned bonus points and a 1st Place win and 2nd Place Release honors in the Cajun Canyon tournament. Matt McDonald's Viking 68 Breathe Easy claimed 4th Place. Captain Patrick Ivie led his team to 2nd Place Blue in the Orange Beach Billfish Classic and 3rd Place in the Blue Marlin Grand Championship. Rounding out the top five on the impressive leaderboard is Allen Krake's Viking 76Team Supreme. Team Supreme, with Captain Stan Blakeman behind the wheel, claimed 3rd Place Release at the Orange Beach Billfish Classic and 2nd Place Blue Marlin at the Mississippi Gulf Coast Billfish Classic. "Congratulations to Jon, Katie, Jason and the entire Done Deal team for another stellar season. The competition was intense, but they truly demonstrated their skill level and commitment to winning," said GCTC Director Scott Burt. "Done Deal has established a dynasty in Gulf sportfishing that is going to be really hard to top." The late Sonny Middleton came up with the concept of the Triple Crown and Scott helped develop and nurture it over the last seven-plus years. "Sonny always thought the Triple Crown was a way to bring all the teams together," Captain Jason explained. "Sonny was the godfather of sportfishing in the Gulf. I hope we're making him proud by claiming our third championship." The Gulf Coast Triple Crown Championship consists of five sanctioned events in the central Gulf of Mexico. The affiliated tournaments include the Orange Beach Billfish Classic, Cajun Canyons Billfish Classic, Mississippi Gulf Coast Billfish Classic, Emerald Coast Blue Marlin Classic and the Blue Marlin Grand Championship. The Triple Crown is scored on a hybrid system that includes both weight and release points for the top three finishes in the blue marlin divisions only. Bonus points are also accrued for series participation, weighed marlin lengths and tournament marlin records. Friday the 13th was a lucky one for Captain Marco Gaona at the helm of the Viking 64 Enclosed Bridge Shockwave during the 7th Annual Blue Marlin Grand Championship. Brien Blakeney's boat bested a fleet of 74 battlewagons to take Grand Champion. Brien's son Austin battled a big blue for almost five hours to weigh a 795.6-pounder. The fish took the early lead and eventual top honors at the event. Perennial contender Done Deal, Jon Gonsoulin's Viking 70, brought a 640.8-pound blue marlin to the scales. Katie Gonsoulin spent eight hours in the fighting chair in order to whip the 117" billfish. Katie also released two blue marlin and a white to take Top Lady Angler and Done Deal claimed 1st Place Release Team. Matt McDonald's, Breathe Easy, with Captain Patrick Ivie on the throttles, weighed a 598.2-pound blue guaranteeing angler Rick Olsen (above) and the team 3rd in the signature category. The Viking 56 Team Galati rounded out the Grand Champion category in 4th place with four blue marlin releases. Team Galati took 2nd Place Release Team as well. Top Junior Angler went to Kevin Courville for his blue marlin release on the Viking 92 A Work of Art. Lisa Krake released a blue on the Viking 76 Team Supreme, which was good for 2nd Place Lady Angler. Larry Wireman fishing the Viking 64 Carib set a new tournament record after boating a yellowfin that tipped the scales at 192.2 pounds. Angler Ashley Faulkner fishing for Team American on the Viking 65 El Gancho weighed a 158.6-pound fish to take 3rd Place Tuna. The Viking 61 Southern Miss took angler Billy Richardson to the winner's circle with the top wahoo weighing in a 56.6 pounds. A fleet of 38 teams put on a fish-catching clinic at the 2018 Bermuda Billfish Blast. Three days of red-hot fishing produced a record 91 blue marlin releases during the event, with most blues ranging in the 200- to 400-pound class. After lines out on day three, Joe Rahman's Viking 80 Auspicious totaled six blue and two white marlin releases across three days of fishing to surpass the field and win the tournament. 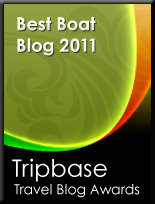 Joe also took Top Angler with all eight releases. Michael Farren's Viking 62 Just A Dog led Chase Farrens to five blue marlin releases to take 2nd Place Team and 2nd Place Angler. Snotty weather didn't deter the 74-boat fleet fishing the 47th Annual Pensacola International Billfish Tournament. The bite started off slow but there were plenty of releases and some big fish moved the scales at the weigh station. Captain Patrick Ivie at the helm of Matt McDonald's Viking 68 Breathe Easy (above) claimed 2nd Place Overall Boat. The team released two blue marlin and weighed a dolphin and wahoo. The blues were released by Katie Hurst and Rachel Ivie which earned them 2nd and 3rd Top Lady Angler, respectively. Madison Ivie weighed the dolphin which won that category with a 100.8-pound fish. Fresh off a victory at the recent Emerald Coast Blue Marlin Classic, Born2Run(above) was again in the winner's circle. Dana and Lisa Foster's Viking 72 won the swordfish category with angler Doug Franklin hauling in a 210.8-pound whopper. Lisa Foster was the Top Lady Angler with a blue marlin release and a pair of yellowfins weighing in at 178 and 94.2 pounds. Pat Healey and Bob Hixson invite you to join your Viking friends for a hunt of a lifetime at the world class La Bandera Ranch in Carrizo Springs, Texas. Two three-day hunts are available September 30 through October 2, and October 3 through 5, 2018. The five-star resort offers plush accommodations with South Texas cuisine and the most abundant population of quail, dove, whitetail deer and ducks this side of the border. Expert guides and dog handlers with all-terrain vehicles are available to assist you.